They’re called hackers and they are portrayed within the collective vision as pirates of the internet age: always prone to mischief and theft. However, beyond the superficial considerations that are embraced and disseminated by hegemonic control, the hacker world is one of the most complex and least mainstream revolutions seen by the 21st century. On February 8, 1996, John Perry Barlow wrote A Declaration of the Independence of Cyberspace for the World Economic Forum held in Davos, Switzerland. Barlow’s document addressed the institutions of hegemonic control, vouching for the liberty of mind and the emancipation from matter as entailed by cyberspace. Although Barlow’s public insertion within society granted him the possibility to make his declaration more well-known, internet manifestos advocating for the freedom of the cyberworld and the nature of hackers started in the 1970’s, shortly after the launch of the ARPANET2. A parallel reality that had emancipated itself from matter, an interstice of reality that mocked time and space, cyberspace became the hub of worldwide collaboration against traditional power and the ripe terrain for hacker culture to flourish. 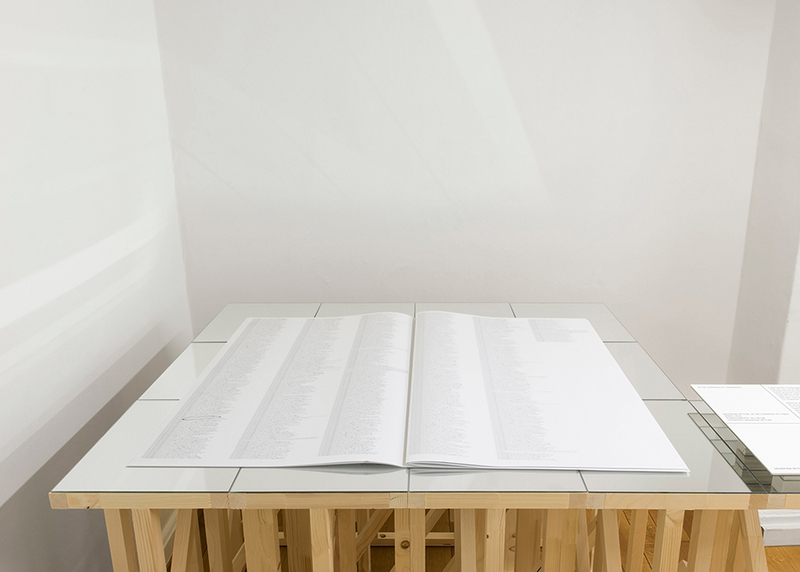 Valentina Vetturi, whose artistic body of work has dealt with themes such as invisibility, memory, secrecy and political engagement decided to become an element of “disturbance” within the unknown and protected world of hackers. Her research was conducted through slowly bred relationships and later interviews with key figures within the hacker world. The drive of her research was to transcend the technical comprehension of the work of hackers and approach the human sphere behind the screens. The first of a series of three works revolving around the hacker world, A Bit for Your Thoughts (2016), was presented by deuxpiece at Carroserie during Art Basel. A Bit for Your Thoughts, like most of Vetturi’s works, included an elaborate composition of media. 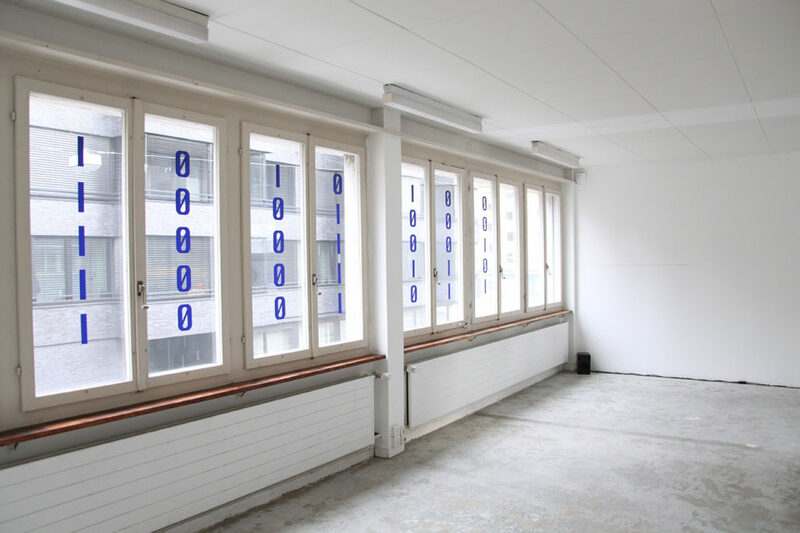 A site specific installation, the work utilized text and sound to address concepts highly pertinent to the hacker culture: anonymity, authorship, the body-less reality of cyberspace, cryptography and digital money. The text within the installation was two-fold. On the one hand, handwritten fragments of text on the walls testified to the stories Vetturi had gathered from her encounters with hackers. Furthermore, two words (“think” and “do”) written in ASCII-code3 were scattered through the space. 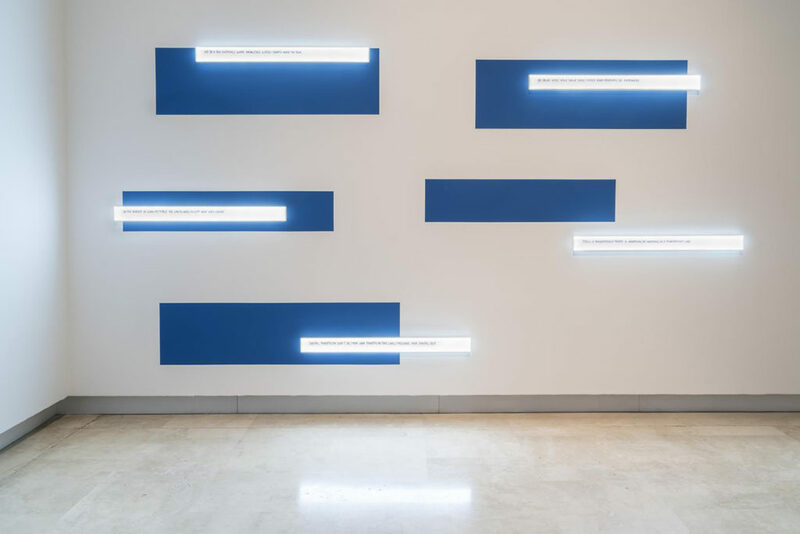 With these two very different textual interventions, Vetturi brought the virtual within the physical space, delivering both the figure of hackers and the nature of cyberspace in a form that allowed recognition and identification by any human spectator. 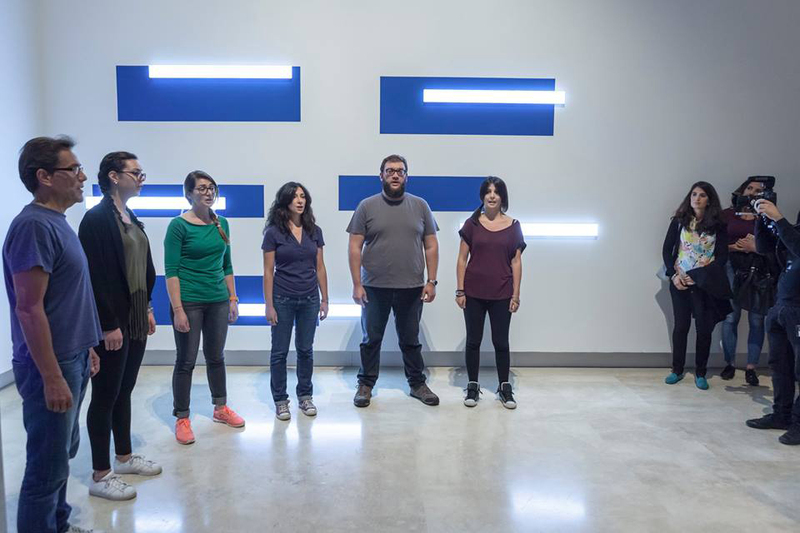 For the sound element of the installation, the artist decomposed and re-contextualized fragments of Barlow’s A Declaration of the Independence of Cyberspace. Barlow’s voice and the text on the walls and windows engaged spectators in the discrepancy between Barlow’s utopic ideals for internet freedom and the current state of affairs of internet control and manipulation. The second work of the series by Vetturi addressing the hacker world was In the Corridor of Cyberspace, presented within “Anarchie! Fakten und Fiktionen” at Strauhof, Zurich, in 2016. 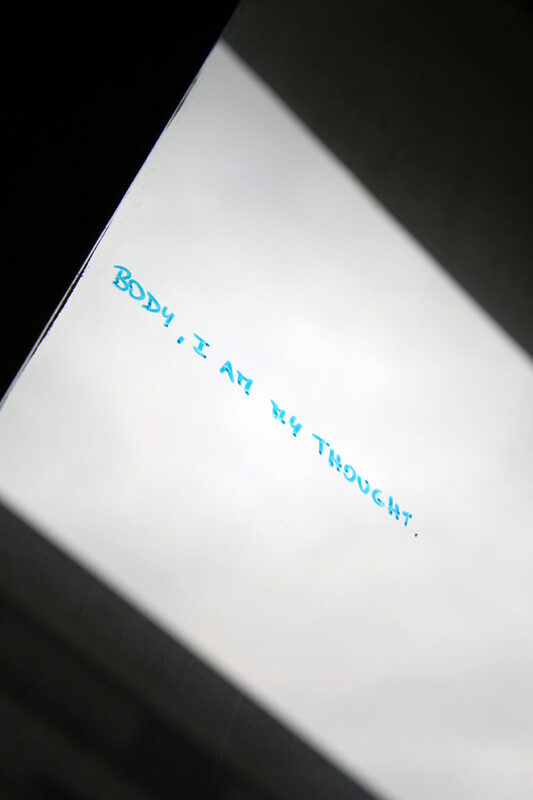 Vetturi’s artistic intervention entailed a large scale artist book (50cmx70cm) with handwritten interventions and a series of talks and public readings. 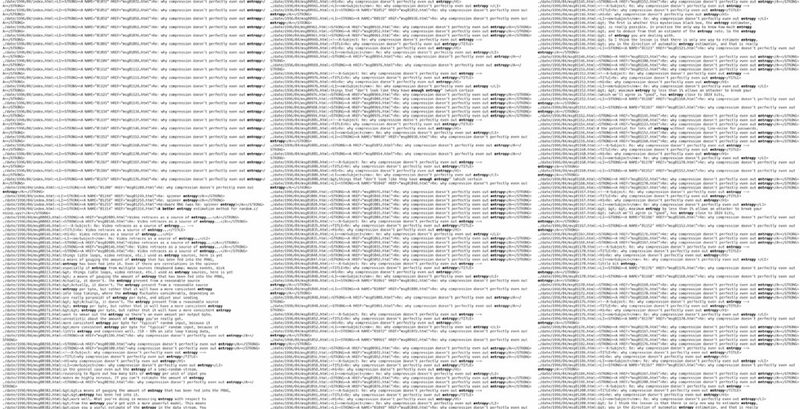 In the Corridor of Cyberspace functions as a testimonial of the artist’s “intrusion” within a relevant online platform for debate: “The Cyberphunk Mailing list”. Established in 1992, “The Cyberphunk Mailing List” gathered a vast array of individuals such as scientists, activists and libertarians to discuss subjects that were pertinent to the internet age. The mailing list included people such as Jude Milhon, Tim May, Eric Hughes, Julian Assange (founder of Wikileaks), and Philip Zimmerman (inventor of Pretty Good Privacy). The mailing list served as a platform for interaction and discussion on subjects pertinent to the internet age like privacy, cryptography, anonymity and digital money. From a plethora of approaches – political, technical, philosophical and mathematical – the platform served as one of the major seeds of crypto anarchy culture. The work of Valentina Vetturi is a testament of her incursion in this web correspondence. Her artist’s book evidences her submersion in a world she approaches as an outsider with an artistic pretext, her findings and her process within the artistic production. The nine voice performance disrupted the exhibition space in a random way, personifying the hacker modality of desired entropy. The performers sang a cacophonous manifesto of sorts, inviting spectators to question the internet imperialism4 that currently mines the liberties of the world-wide-web, imposing a Foucaultian model of panopticon surveillance on internet usage. With the performance and installation, the artist writes her own manifesto embracing the anarchic voice the web once represented, disseminating the struggle for transparency and equality behind the best hacker ethics. Valentina Vetturi’s series on the hacker world triggers reflections on the libertarian nature of free information and transparency the internet once promised. Today, institutional powers have found a plethora of ways to manipulate and commodify internet usage, menacing the freedoms technology once offered. Vetturi leverages the findings of her research on the field in order to shed light on a subject that touches us all: there is no need to be a hacker in order to feel and acknowledge the control of the imperialisms of the internet age. Furthermore, as an artist, Vetturi once again explores her role as an intruder. In this instance and different from previous works, she is an intruder amongst intruders of the web. This double intrusion enables a multi-layered series of disruptions that are coherent with the entire hacker idea: the artist intrudes a community of people who invade silently, while rattling the spectators’ sense of virtual security and the presumed independence of online identity, extrapolating the virtual and re-interpreting it within a physical exhibition space. 2 The first ARPANET link was established between the University of California, Los Angeles and the Stanford Research Institute at 22:30 hours on October 29, 1969. The ARPANET, together with other networks were the beginning of the internet as we know it today. 3 ASCII-code is one of the most widely used binary text-codes used fro computers. 4 Internet usage is currently undergoing a strong control ploy. Systems such as Big Data are a perfect example of digital control and the commodification of internet usage. Hackers refer to these internet powers as the GAFAs (Google, Apple, Facebook and Amazon). Barlow, John Perry. “A Declaration of the Independence of Cyberspace”. Manifestos for the Internet Age. Greyscale Press, Poland. 2015. Setter, Kim. “Hacker Lexicon: What are White Hat, Gray Hat and Black Hat Hackers?”. WIRED. April 13, 2016. Gibson, William. “Burning Chrome”. Omni, Burning Chrome, July 1982.